Rendering of redevelopments at City Place in Fort Worth, on the site of the former Tandy Outlet Center Mall. Formerly known as the Tandy Center and previous headquarters of RadioShack, City Place has had a long history in the heart of downtown Fort Worth. Spanning four blocks in the Central Business District adjacent to Sundance Square, the complex consists of the three separate buildings totaling 1.2 million square feet. The four-story low rise building, City Place Center, connects the two 19-story towers, One and Two City Place. City Place enters its new era this year. 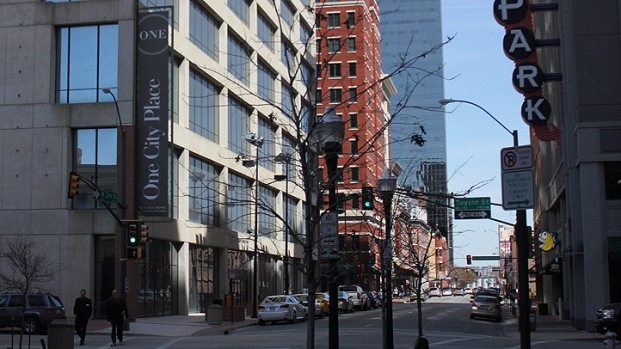 As of February 24, Dallas-based Spire Realty acquired the complex from PNL. Spire Realty Group, L.P., a privately-held real estate investment and management company plans to keep the City Place name and fully renovate the south tower, One City Place, into a class A office building similar to Two City Place. The four-story City Place Center connecting the two towers, or “central block” as Ruff refers to it, has been demolished to create a new street-level promenade with retail shops. Spire plans to construct additional parking above and below for the new plaza as well as for both towers. The origins of what's currently called City Place began in 1929 when the old Leonard's Department Store started construction of the 25-foot storefront at 200 Houston Street. By 1963, the Leonard Brothers opened the underground Leonard’s M&O Subway using modified cars from Washington, DC’s abandoned streetcar system. Tandy Corporation demolished the Leonard’s Department Store after buying the store and subway from the Leonard Brothers in 1976. The Charles D. Tandy Center was built in its place housing a shopping mall anchored by Dillard’s, an indoor ice rink, and two landmark office towers. The entire complex was completed in 1978 and became known as The Tandy Center. Leonard’s M&O Subway was changed to Tandy Subway and ran for the last time in 2002. Popularity of the mall began to wane in the 1990s leading Dillard’s to move out. Virtually vacant, the mall was reborn in 1996 as a 200,000 square foot in-town outlet mall, Fort Worth Outlet Square, but was still not successful. The mall and ice rink were both eventually closed and converted into office space for RadioShack Corporation, Tandy’s new name as of 2000. RadioShack Corporation sold the Tandy Center the following year to the PNL Companies who renamed the complex City Place. By 2008, PNL renovated its north tower, Two City Place, into a class A office building which is now 82 percent leased. PNL had plans to build condos at One City Place to the south but put the property up for sale before the housing came into fruition. One City Place has remained vacant since 2005. Now that Spire Reality Group has claimed the three building site, they’re remaining ambitious in other large office acquisitions with developments in Dallas, Austin and Houston. “City Place is our third major acquisition in the past year,” said president of Spire Realty Group, Caleb Smith in a press release. 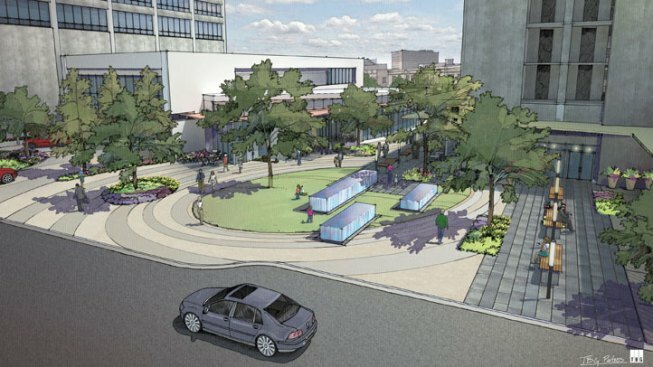 Spire has expressed their enthusiasm about being the new face of City Place in Fort Worth. Ruff says the realty group doesn’t plan on going anywhere, “We’d love to continue to grow in Fort Worth. We’re long-term owners and like to be involved in the day-to-day of our markets. It’s important to us to have a presence in Fort Worth”.